In this week’s edition of Roxor Weekly we’re tackling some of the biggest questions about the quirky UTV we know and love. What will one do on a dyno? How hard are aftermarket parts to install? Is it right to call the Mahindra Roxor a Jeep? Is it similar in any sense? And is it better off-road than other UTVs in its price range? Stephen Elmer and the team at TFL Offroad are the first people to put the Mahindra Roxor through a proper head-to-head battle against two of the nearest competing side-by-sides. The challengers are a Polaris Ranger and a Honda Pioneer, each a highly capable workhorse UTV that wouldn’t break a sweat hauling a load of rocks in the desert or firewood to a remote Alaskan cabin. They’re also priced similarly to the Roxor, both in the United States and in Canada where this test took place, and the result is something you may not expect. This film features a Roxor LE which comes standard with BF Goodrich KO2 tires in size 235/70/R16. Notably, it also has open differentials. These two factors, combined with the Roxor’s comparatively low ground clearance, are what separate it from the other UTVs when the going gets tough – but it’s not all in the Roxor’s favor. Time and again the lack of grip from the open diffs proves to be a big problem, as the Mahindra is superior in towing and descents but lags behind the Polaris and Honda in tests involving deep mud, water, and even ice. The Roxor’s superior torque should provide an advantage over soggy terrain. The problem is grip. We have found that adding open differentials to the Roxor will improve grip dramatically in low-traction situations. In fact, we’re confident that with locking differentials, more aggressive tires, and a 4” suspension lift the Roxor would not only keep pace with the Ranger and Pioneer in a rematch, it might even outperform them. And considering the price of a base-model Roxor, you could add these upgrades and still come out ahead of what you’d spend on the competition. One of the Roxor’s biggest strengths from an enthusiast’s perspective is how easily it can be modified to fit your needs. In this installation video, Youtuber Red, White, and Roxor adds an OEM oil pan skid plate to his Mahindra Roxor. The installation itself proves to be straightforward. After getting the Roxor in the air for extra clearance, the skid plate goes on without much trouble at all. As with any automotive project, the more extensions and elbows you have on hand, the easier things tend to go. Having tiny hands isn’t necessary for this one, but it always helps. At the time of this writing the OEM Mahindra Roxor oil pan skid plate goes for over $150. The one we have in our store is of equal or better quality and sells for just $85. 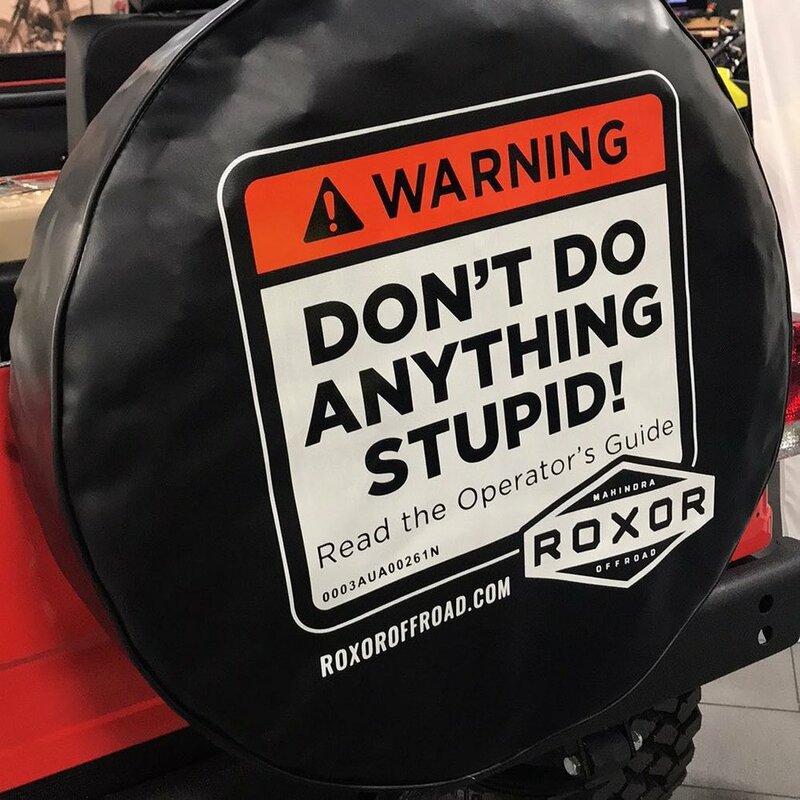 It’s critical to protect this part of your Roxor if you plan on doing any spirited off-roading. The last thing you need is for all 7.4 quarts of your Roxor’s engine oil to end up on the ground! The words “aftermarket exhaust” might remind you of buzzy Honda Civics and roaring Ford Mustangs, but installing a more free-flowing exhaust system helps your engine to breathe better, thereby increasing horsepower and torque with the added benefit of a better sound – if that’s your thing, of course. It’s certainly the style of the team over at Vivid Racing, who have produced this video demonstrating the power gains from their in-house aftermarket exhaust system on a dyno. The test begins with the stock exhaust which returns figures of 67 horsepower and 159 lb.-ft of torque at the rear wheels, an average result of three separate pulls, which is surprisingly higher than the factory numbers of 62 hp and 143 lb.-ft.
With the turbo-back aftermarket exhaust fitted, not only did horsepower and torque increase across the board, but a nice turbodiesel whine is now clearly heard both at idle and while driving. Installation of the exhaust is certainly easier when you have a lift at your disposal, but from what the video shows one could easily manage this upgrade in a home garage. It’s worth noting that this exhaust is not yet available for purchase – we’ll keep you posted as we get closer to its release. Is the Mahindra Roxor a Jeep or Not? YouTuber and friend of the site Abiez recently tackled one of the most important philosophical questions of our time: is the Roxor a Jeep in its own right, or is it something else entirely? We’re watching this video last for a reason. After everything we’ve learned today, from the Roxor’s performance off road to its performance on a dyno, now is the perfect time to look beyond the Roxor’s Jeep-like exterior and consider its true identity in the off-road world. If you’re not familiar with the Jeep brand’s history, Abie does a fine job of summing it up. That includes the acquisition of licensing rights by Mahindra in the late 1940s and their subsequent production and sale of Jeeps in India. He then tackles what has become a hotly debated topic, not only on Roxor enthusiast forums and at off-road parks from Canada to India, but also in the board rooms of Fiat Chrysler (owners of the Jeep brand) where a movement is currently underway to halt sales of the Mahindra Roxor in the United States based on its striking similarity to vintage Jeeps. Similarity? Whatever could they mean? Is the Roxor a Jeep? Fundamentally, no. The Mahindra Roxor is not produced by Fiat Chrysler. It uses proprietary manufacturing techniques and proprietary parts made by Mahindra and other suppliers, and in critical ways it differs from any vehicle which ever wore the Jeep logo. But the word Jeep has become eponymous with off-roaders of all types, like Kleenex to tissues or Trampoline to, well, trampolines. The more pertinent question is whether a Roxor should be compared to a Jeep in concept, and whether people should embrace its Jeep-like appearance or take pride in the Roxor’s identity as a vehicle all its own. Roxor Weekly is brought to you by Dirt Legal. Our job is getting out-of-state titles for powersports toys like the Ranger, Pioneer, and Mahindra Roxor. We will get you a title, license plate, and registration to help make your Roxor street legal anywhere in the United States. Click the link below to learn more. We’d be honored if you followed our blog through the Dirt Legal Facebook page. If you take an amazing photo or video of your Mahindra Roxor, send it to us at info@dirtlegal.com. If we like it, your work may be featured (and credited) in an upcoming article.